When it comes to making quality connections with concrete professionals who are actively searching for decorative concrete products, services and supplies, there’s no better place to start than with the Decorative Concrete Product Guide. More than 20% of concretedecor.net website visitors access the online Product Guide each month and the printed version is seen by more than 100,000 contractors worldwide. When you participate in the Product Guide + Product Locator, you receive a full year of visibility on the world’s leading decorative concrete website for about as much as you’d pay for a specialty coffee each month. If your company makes products used in new concrete construction, refurbishing or repair for residential, commercial or municipal construction, there is no other place to be but in Concrete Decor’s Decorative Concrete Product Guide + Product Locator. 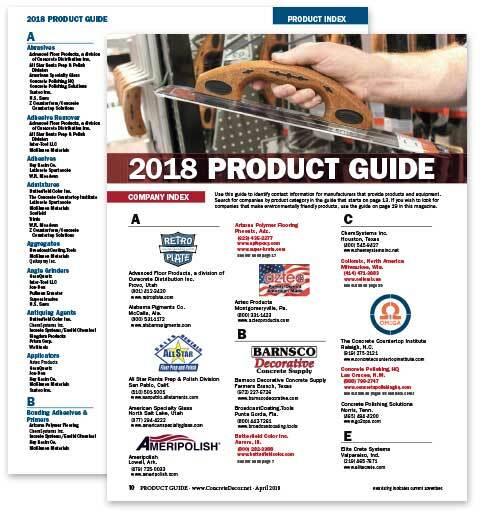 Your company name will appear in the print version of Concrete Decor magazine in the Product Index under each of the product categories you select. In addition, your category choices will be included with your company information in the Company Index. Your company information will appear in the listings for each product you select and categories will be listed after your company’s contact information (Premium and Select Plus Packages only). The store location feature (qualified packages only) includes a “Where to Buy” link on your company information listing that will display all store locations. Links to your website, an email lead form and social media links are all available as added features. Your visibility can be increased by having your logo appear in site-wide search results based on keywords you select (only available with certain packages). Contact your Account Manager for additional options to increase exposure.